There has been a change in the fashion industry over the past few years. We’ve seen the infiltration of the body positivity and plus size movements as well as various people campaigning and working for more inclusion and diversity on the runway and in print advertisements. These very important movements give voice to women in way like never before, showing that those who are visual representations of “fashionable” or “stylist” females are not only defined by their physical appearance or outfit, but by their whole self. By the fashion industry acknowledging the consumers’ need for more brevity and authenticity in their messages, we seeing a much wider conversation and definition around the idea of “beauty”. There is no single way to describe it, and one industry publication is certainly no longer the final authority on what a person should or should not aspire to when it comes to creating their own style. A new video series from Prada’s Miu Miu label has encompassed this in a really cool way, by showcasing a number of different women in their own element and within their own voices. ‘Women’s Tales’ was started in 2011 as a way to celebrate female directors and notable female subjects around the world. They have 12 videos in total, and this year, the two they released are called ‘Seed’, directed by Naomi Kawase, and ‘That One Day’, directed by Crystal Moselle. ‘Seed’ tells the story of self-discovery through the eyes of Sakura Ando who travels from being surrounded by nature in Nara, to the city lights of Tokyo. Luxury Daily’s Sarah Jones describes it as a specific celebration of Asian femininity by transporting consumers to Japan through the eyes of one woman. ‘That One Day’ features real-life skate crew The Skate Kitchen based out of NYC, and showcases the life of skater and teenager Rachelle Vinberg whose mission it is to skate with the boys, despite her timidity. Crystal Moselle’s documentary filmmaking skills may be familiar to some, as she is the director of the critically-acclaimed ‘The Wolfpack’. It seems like these are the kind of stories you would find at a film festival, rather that on an internationally-renowned fashion label’s website, but this is the change we are beginning to see. Fashion and film collide in this ongoing series. “While the videos may feel like a breakaway from traditional luxury apparel content since they don’t center foremost around Miu Miu’s apparel, they tell a story with a message that’s is likely to resonate with the brand’s target audience,” said Shuli Lowy, co-head of Women in Wireless NY to Luxury Daily. “Branded content does not need to be entirely focused on a brand’s product. Rather it needs to connect with the target audience while showcasing the product,” she added. She also highlighted that brands such as Unilever are seeing as much as 12% better involvement with consumers when their messages are more progressive when it comes to gender equality. “At times, sharing those poignant messages, particularly around gender stereotypes, can create a stronger brand affinity than a traditional video of shoes and dresses,” said Shuli. “The subject matter of the film is meant to spark a conversation surrounding women’s empowerment and inspire girls not to compete but instead support each other. The aesthetic of the film and fashion styling of the girls, paired with the skate culture, invoked a trendy feel to the narrative,” writes Luxury Daily’s Brielle Jaekel about the ‘Women’s Tales’ series. The videos have been showcased at New York Fashion Week as well as the Venice Film Festival in previous years, where 87 year-old director and Cannes Film Festival Palme d’Or winner Agnès Varda screened ”Les 3 Boutons’, a short film about Jasmine, a 14-year-old girl whose chance encounter with a surprise parcel containing a gigantic ball gown leads her on a surreal adventure through an ordinary town. Previous directors include ‘Selma’ director Ava DuVernay who shot ‘The Door’ in 2013, ‘Spark and Light’ by Korean American So Yong Kim, and Miranda July who shot ‘Somebody’ which also screened at the Venice Film Festival. Industry insiders are recognizing the incredible potential of reaching consumers and fashion lovers as nuanced and complex individuals who have many interests, rather than a stereotyped person who is only superficially interested in fashion as a singular-focused vehicle. “When brands are willing to take a position, it’s always a great way for them to get in touch with their audience and those who wish to know more about their inner workings. I think that this film will definitely generate conversation on changes that have been requested within the industry. This film allows these conversations to exist through social media by examining brand representation—models, personalities,celebrities, body image, racial inclusion—the role of the media and how brands wish to be defined within this new and continually evolving age, ” said Kimmie Smith, co-founder/creative director of Accessory2, New York to Luxury Daily about So Yong Kim’s ‘Spark and Light’. This could be said about the entire series. We find it shameful that it has taken us this long to discover ‘Women’s Tales’, but we are in love with the messages, themes, and conversations they are creating as a means of disruption of fashion norms. Of course it all comes down to what works best in terms of marketing and what is going to make a brand more money, that is just a given. But there is nothing wrong with championing the trend that is positioning women as agents of their own power and their own stories, rather than being seen as commodified beings which should be dictated to by a designer or fashion magazine. 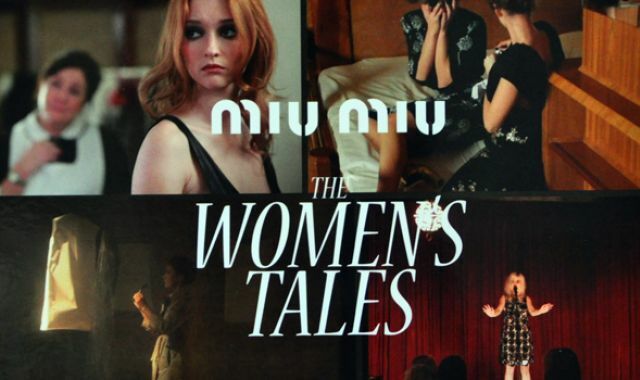 You can see all 12 of the ‘Women’s Tales’ videos, as well as behind-the-scenes interviews, by going to the Miu Miu Youtube Playlist.